The PCL comprised of a bundle of ligament fibers attaching the back of the tibia (shinbone) to the femur (thigh bone) in the knee. It is one of the two cruciate ligaments in the knee (the other being the anterior cruciate ligament, or ACL). 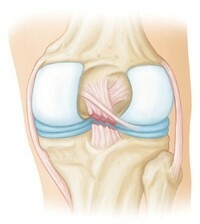 The PCL crosses the ACL in an "X" shaped pattern. The ligaments work together to control the forward and backward motion of the knee. several stabilizing ligaments of the knee. 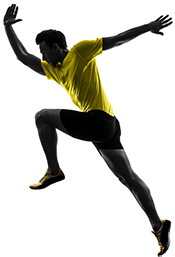 The main responsibility of the PCL is to prevent the tibia from moving too far backwards. Injuries to the PCL typically occur when a sudden, strong force is applied to the front of the tibia, often referred to as a"dashboard injury." It is named such because it can commonly occur during a car collision when the dashboard impacts the tibia. The PCL can also be injured when playing sports. This type of injury commonly occurs when an athlete falls on the front of their knee, causing it to suddenly hyperflex (bend all the way back). Injuries to ligaments are referred to as "sprains." These sprains are graded according to the severity of the injury. Grade 1 sprains are injuries to the ligament where only mild damage has occurred. The ligament has been stretched slightly, but is still capable of providing stability to the knee joint. Grade 2 sprains occur when the ligament is stretched to the point of permanent laxity and some tearing of the ligament has occurred. This type of sprain is often referred to as a partial tear. Grade 3 sprains are complete tears of the ligament. 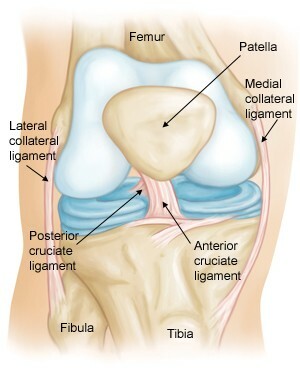 In a grade 3 sprain, the ligament has been split into two pieces, making the knee unstable. PCL Injuries are commonly seen in conjunction with injuries to other structures of the knee. The most commonly missed associated injury is an injury to the posterolateral corner of the knee. During your visit to The Stone Clinic, Dr. Stone may use a combination of your medical history, physical examination, MRI imaging, and X-Rays to determine the injured structures in your knee. A description of the trauma to your knee is helpful in making an initial diagnosis of your injury. A physical examination can test for abnormalities in the function of the PCL. MRI and X-Ray are used to confirm and clarify the extent of the injury and to detect other structures that may be injured as well. For low grade injuries to the PCL, Dr. Stone may recommend a regimen of physical therapy. The program will focus initially on immobilizing the PCL and reducing the swelling and inflammation associated with the injury. Specific exercises will be introduced to restore the function of the knee and to strengthen the supporting muscle groups that support the knee. Following a thorough examination of all other compartments of the knee for any other damaged tissue, the posterior cruciate ligament (PCL) is well probed to determine the integrity of the remaining fibers. If there is adequate, good quality tissue with some of the remaining fibers still attached, then a PCL repair is performed. If the tissue is irreparably damaged, a reconstruction using a donor graft is performed. Complete tears of the PCL are best treated with anatomic reconstruction. In the past isolated PCL injuries were left alone due to the fact that the reconstruction techniques were not reliable. However patients with torn PCLs develop medial compartment and anterior compartment arthritis and the knee does not feel stable. With our technique, anatomic PCL reconstruction using sterilized allograft bone patellar tendon bone grafts has led to stable athletic knees.